New York, NY (April 9, 2018) – Valiant Entertainment is proud to announce, that, as of April 5th, it has added celebrated comics professional Joe Illidge as Executive Editor. Illidge will work closely with Editor-in-Chief Warren Simons as they spearhead the publishing plan of Valiant moving forward, including continuing work on critically acclaimed titles like SHADOWMAN, X-O MANOWAR, BLOODSHOT SALVATION, NINJA-K, andQUANTUM AND WOODY! ; the upcoming, hotly anticipated HARBINGER WARS 2 crossover event; 2019’s revelatory, prestige series, THE LIFE AND DEATH OF TOYO HARADA; and more, yet-to-be-announced projects. 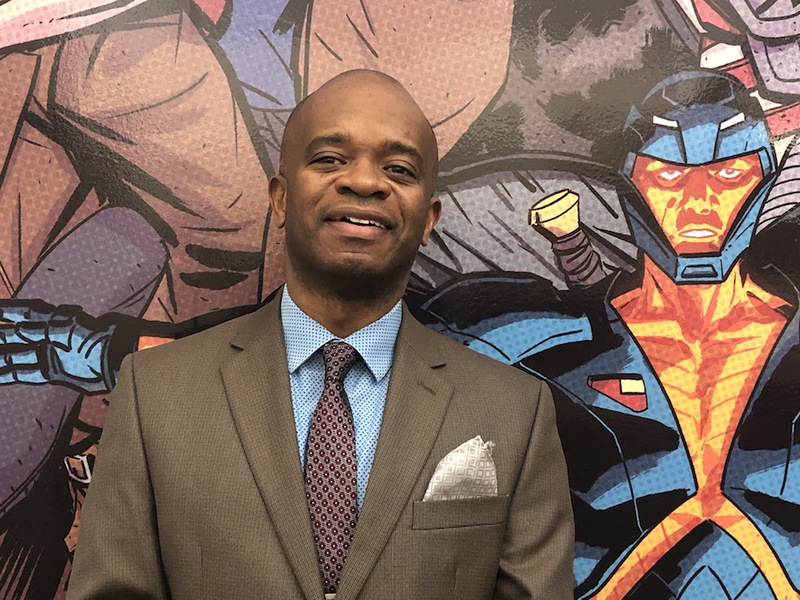 Illidge’s first job in the comic book industry was at Milestone Media, Inc., the groundbreaking comic book publisher and creators of “Static Shock,” the character featured in the award-winning WB animated series. As an editor on the Batman line of comic books for DC Entertainment, his tenure included the year-long event “Batman: No Man’s Land” and Batman line-wide relaunch. Illidge’s experience as a Batman editor led him to become the DC Entertainment liaison with WB’s animation team on the critically acclaimed Batman Beyond animated series. Recently, Illidge was a Senior Editor for Lion Forge Comics where he spearheaded “Catalyst Prime,” the publisher’s superhero comic book line featured in The Hollywood Reporter and Entertainment Weekly. Illidge was listed as one of the “Best Editors of 2017” by Comicosity. In addition to his coverage by The Washington Post, The New York Times, CNN Money, the BBC, Entertainment Weekly, The Hollywood Reporter, and Publishers Weekly, Illidge has been an invited speaker at John Jay College of Criminal Justice, the C3 Comic Creator Conference, Skidmore College, San Diego Comic-Con, his alma mater The School of Visual Arts in New York City, Purdue University, the Schomburg Center for Research in Black Culture, and The San Francisco Public Library. Illidge was featured in the 2017 History Channel documentary series, “Superheroes Decoded,” discussing popular comics icons from Batman to Luke Cage. “In my new role as Executive Editor, I look forward to working with the great people here to lead the Valiant Universe of characters to the next evolutionary stage and unlocking the ideas that will further cement Valiant’s foothold in an industry of new growth areas and paradigm shifts,” Illidge added. “With Vin Diesel about to embark on playing Bloodshot in the upcoming film and people like friend Reginald Hudlin on board to shape the story of Shadowman for a global audience, Valiant Entertainment is going to continue to be the provider of quality stories on a worldwide scale. “I’m a fan, and I stand on the shoulders of giants in shepherding this amazing mythology, so expect the future to be even more Valiant,” Illidge concluded. Valiant was recently acquired by DMG Entertainment, a Los Angeles-based leader in global entertainment with diverse holdings and operations. Under the DMG umbrella, Valiant’s characters continue to be forged and brought to life in publishing, licensing, film, video games, and beyond. Valiant and DMG most recently announced a multi-picture deal to bring BLOODSHOT and HARBINGER to the big screen as feature films. Valiant Entertainment, a subsidiary of DMG Entertainment, is a leading character-based entertainment company that owns and controls the largest independent superhero universe in comics. With more than 80 million issues sold and a library of over 2,000 characters, including X-O Manowar, Bloodshot, Harbinger, Shadowman, Archer & Armstrong, and many more, Valiant is one of the most successful publishers in the history of the comic book medium. Valiant consistently produces some of the most critically acclaimed comics in the industry and has received numerous industry awards and accolades, including a Diamond Gem Award for Comic Book Publisher of the Year.